Simply enter below! Giveaway is open to all entries. Winner will be drawn and announced 12-13-14. Good luck! 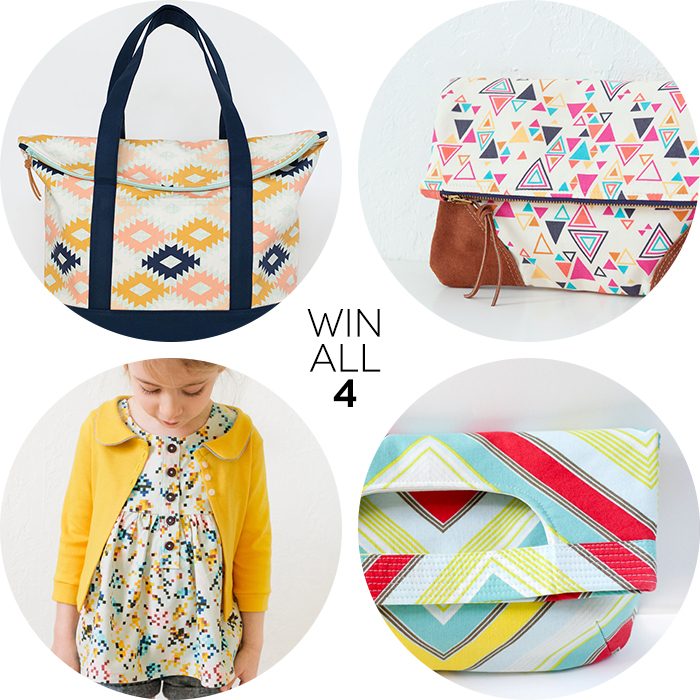 Make sure to stop by Sew Mama Sew to enter lots more giveaways. I just wanted to thank you for doing giveaway day. I love your patterns and I've made many a crayon carrier for the kids with your tutorial. Your bag patterns are lovely. I just have to get brave enough to try making one! I love your patterns! Thanks for the generous giveaway - and for not making us jump through too many hoops to enter! These are all 4 great patterns...I'll use them all! A gorgeous set of patterns. Thanks for the chance to win them. Love all patterns! Thank you for the giveaway! Love the patterns! Thank you! Thank you for the giveaway. I love your leather accent bag! Ooh, your patterns are a super lovely reason to pull out my sewing machine & blow the dust off of it!! Oh this is wonderful, thank you for sharing. Learning to make a bag for myself is on my to-do list next year. These would be great. Oh these are all great patterns! thank you so much for the chance to win them but even if not i'm so glad to know about them! I would love this, i love all your sewing projects! I'm loving the leather corners on that clutch! Thank you for the giveaway! The patterns are lovely!